Among his many activities, Sherab Gyaltsen Rinpoche is a retreat master of the three-year retreat center in Pharping, he has built and oversees a monastery of a hundred nuns west of Kathmandu, and plans to build a monks’ monastery east of the capital are moving along. Several times a year Rinpoche leads thousands of practitioners in the practices of Nyungne (fasting meditation) and Loving Eyes at his Nyeshang monastery in Swayambhunath. Over fifteen billion mantras have been accumulated over the years. Rinpoche’s teaching style is deep, direct and accessible. His teachings, peppered with practical advice, stories and warm humour, leave a lasting impression on all fortunate enough to hear them. 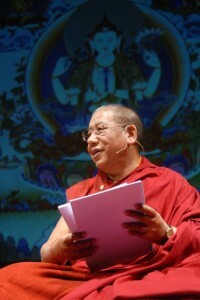 Sherab Gyaltsen Rinpoche first visited the UK in 2009. Rinpoche came to London with Lama Ole Nydahl and gave teachings on meditation, and an empowerment of Karma Pakshi. Rinpoche stayed in the London Diamond Way Buddhist centre and gave informal teachings and the long reading transmission (Tib. lung) for the Four Foundational Practices (Tib. Ngöndro). In 2013, Sherab Gyaltsen Rinpoche again came to the UK. Rinpoche inaugurated the meditation hall in the London Diamond Way Buddhist centre, gave teachings on compassion, and conducted a fire puja, a traditional Tibetan ceremony to clear away obstacles to spiritual growth. Rinpoche also gave an empowerment of Loving Eyes (Tib. Chenresig), the buddha of compassion. Read more about Sherab Gyaltsen Rinpoche’s 2013 London visit on our UK Buddhist blog.